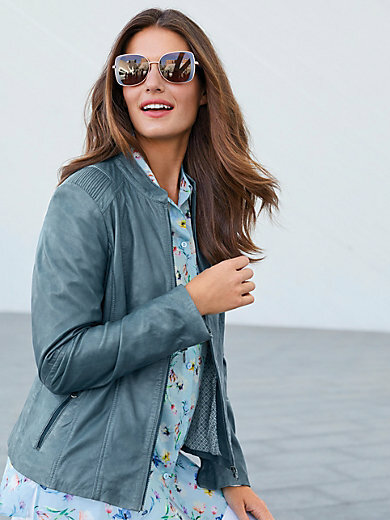 Leather jacket by EMILIA LAY: this piece with long sleeves has everything to become your favourite: a pretty colour, soft, top-quality lambskin nappa leather and an excellent cut. With stand-up collar, zipped pockets, and fastening on the sleeves. Flattering panel seams and patterned lining. Lining in 100% polyester. Length in size 16 approx. 24ins. Special leather clean.